Rock salt as per taste If you not making it for fasting days use, you can use normal salt. Peel the boiled potatoes and press them between your fingers to break them roughly. 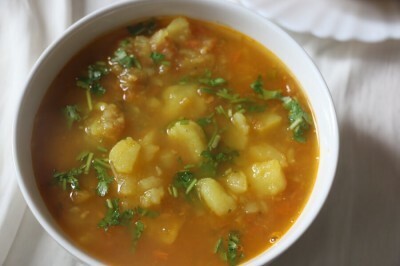 If you wish you can chop them but breaking potatoes with fingers gives a better texture to this curry. Finely chop the tomatoes and green chilies, and grate ginger. In a pan heat oil and add cumin seeds. When cumin seeds start spluttering add asafoetida, saute for 2-3 seconds and add ginger and chopped green chilies. Let them cook for around a minute. Next, add in the tomatoes, salt, and all the spices. Mix and cook for 4-5 minutes or till the tomatoes are cooked and turn mushy. When the tomatoes are ready, add in the boiled potatoes. Mix well and saute for 1-2 minutes and then add around 4-5 cups of water depending on how thick you want it (If you have used your fingers to break the potatoes then automatically some part of potatoes would have got mashed during the process. However, if you chopped the potatoes then mash some potato cubes using the back side of your spatula. This will give it a nice consistency). Let the curry simmer for 5-6 minutes. Garnish with chopped coriander leaves and serve with Indian bread or steamed rice.